Memorizing scripture, though something I am admittedly poor at, is so very important. I don’t know about you, but rarely does a situation requiring a passage of Scripture arise when I actually have my bible open in my lap to search for my favorite highlighted verses. When a friend needs a little encouraging truth, I don’t have time to stop and look one up in my bible app. When I begin to lose my cool, I usually don’t feel like doing a topical search in a concordance to come up with just the right verse to set things straight. Truth must be deeply embedded in my mind when I need to bring it to my lips. I’ve seen recommendations to put post it notes with scriptures on them inside your cabinet doors or on your mirrors. Perhaps I don’t linger in those places as long as you do, but my mind is often not set on things above when I’m searching the kitchen for the baking dish I need or splashing on some mascara before racing out the door for the day. My time comes when I’m in the pick up or drop off lines waiting on my kids, waiting on the doctor’s appointment I was fifteen minutes early for, or in the express lane at the grocery store with a shopper in line ahead of me who has certainly exceeded the maximum number of items allowed… Can you relate? But in those places I generally don’t have my bible handy. So, how can we maximize our moments spent waiting? 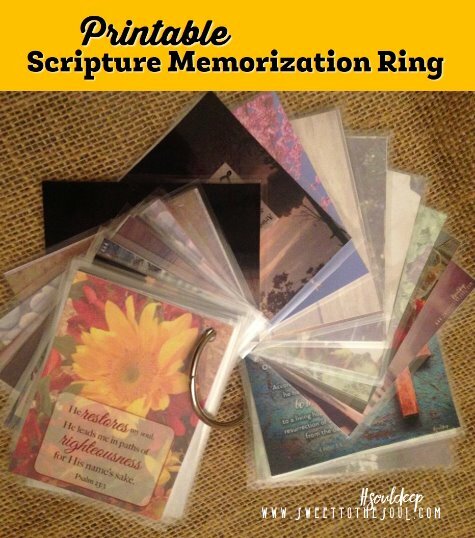 .... With Printable Scripture Memorization Rings. 1. 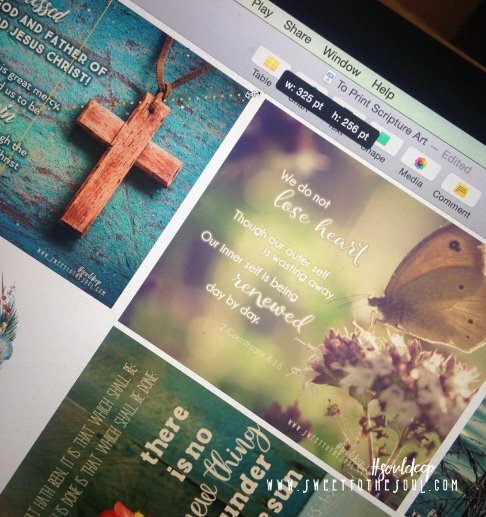 Purchase your scripture art journal from Sweet to the Soul Ministries (http://sweettothesoul.com/shoppe-souldeep) or download each week’s verses from Sweet To The Soul's fb page and paste into a word or power point (or the MAC equivalent) file. 2. Resize to approximately 325 pt wide by 250 pt high. This should enable you to get 8 or 9 per sheet. You can really squish them together. ​3. 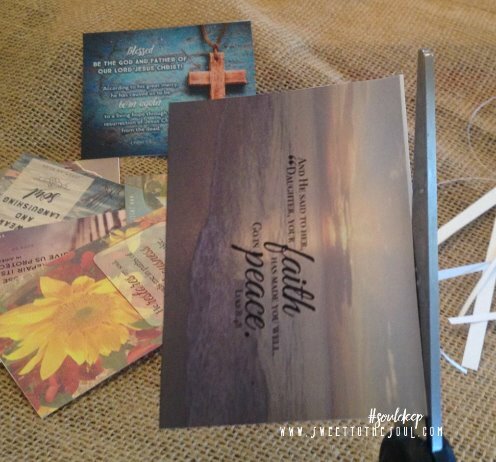 Print the verses you would like to memorize in full color on card stock or take the file to an office supply store that does printing. 4. 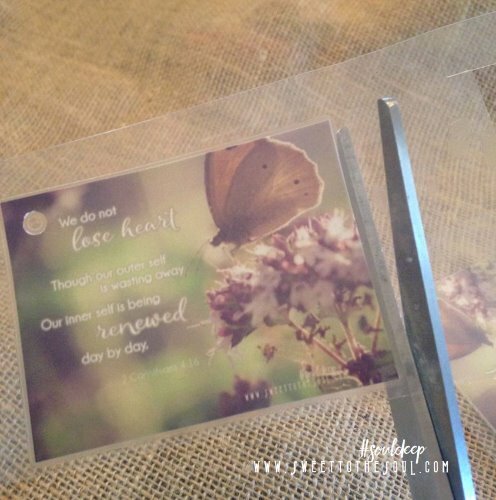 ​Cut out the beautiful art work right along the edges. Stack them up one last time to make sure they are all just about the same size and trim as necessary. 5. Punch a hole in the corner. Upper left hand corner for landscape (which is longer than high) and upper right for portrait (taller than wide). 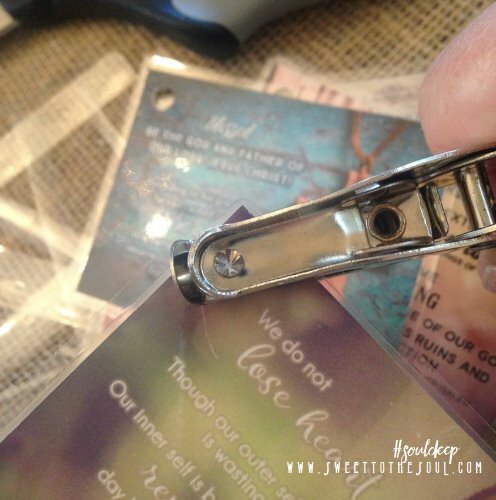 If you place a punched card on top of the next one to punch, you can line the hole punch up and have your holes in just about the same spot on all the photos. ​6. 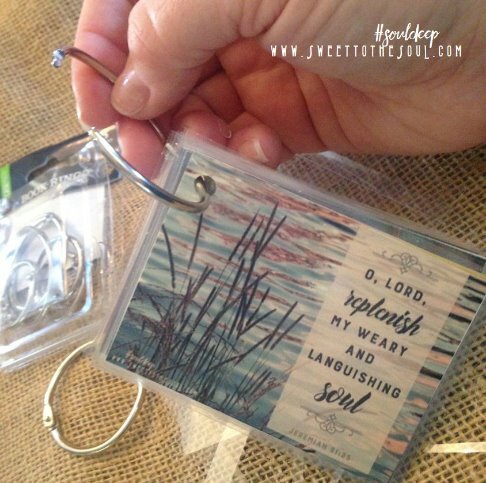 Optional - Before you laminate, tape the scripture art to the back side of a patterned paper (if using) and trim around the edges to finish. Or, you could choose a friend to pray this verse over and write their name on the back. 7. Suggested - laminate the pieces using whatever method you’ve chosen according to the manufacturers directions. Be sure to leave at least a 1/4 inch between the cards to ensure an adequate seal. 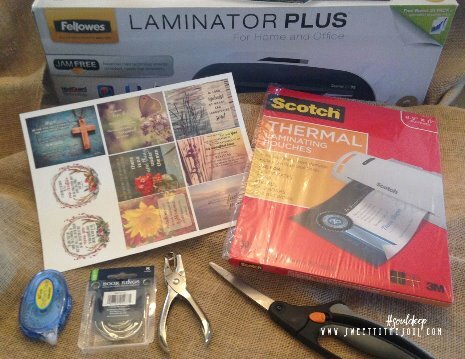 If using a heat laminator, it is helpful to place a folder under the plastic to keep the cards in place as it feeds through. If using press and seal lamination pouches, press firmly around the edges. 8. Trim again leaving approximately 1/8 inch (about the width of the blade of your scissors overhang of the laminate material. 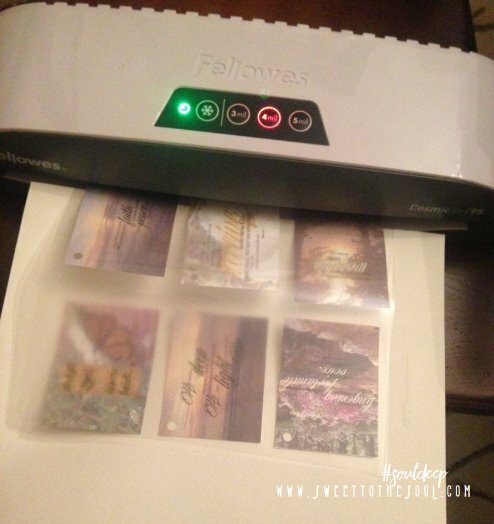 Ensure you don’t cut too close or the lamination layers may separate. You may want to slightly round the corners for safety. Punch another hole though the plastic in the same position as your first hole. 9. Place the card on the ring and close. 10. Add verses when you find another you’d like to memorize or once you’ve finished memorizing the first. 11. Keep the ring on your key chain or clipped to a safe spot in your purse so it will always be handy when you need to maximize your moments with memorization. Make one for yourself and another to send to a friend. These would also make great gifts for anyone who needs a little encouraging, patients undergoing chemo, or deployed Soldier. Mine came in handy today while I was waiting in the doctor's office. our #SoulInspired series "I create so that my soul knows I am listening"
​Liz Giertz is a Veteran turned Army wife who is passionate about helping women become the Masterpieces God created them to be. 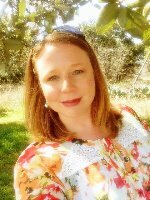 She hosts craft workshops though her business and writes devotional blogs at My Messy Desk (www.creativeinspirationsatmymessydesk.com). Until the next set of orders arrive, she, her husband, and their two boisterous boys call FT Hood, Texas home. I love this idea, Liz! Thanks so much for sharing with us. 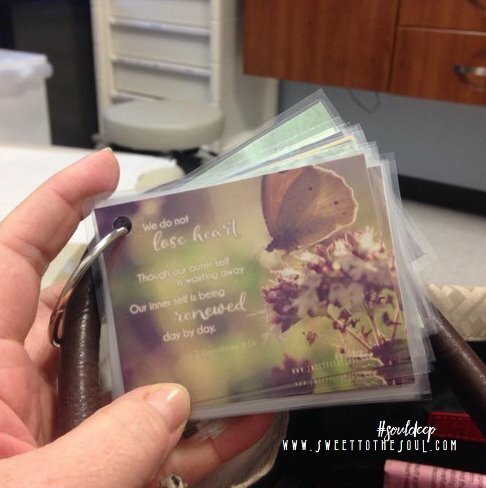 Our student support class at school makes these to help kids memorize vocabulary words and history facts, but I never thought of this technique for cute scripture cards! So fun:) Thanks for the great idea, girls! So neat Liz! Love this idea.